If you have an IRA, you know how easy it is to move assets from one investment to another. You’re able to choose from a wide array of investment options, and to take out money whenever you want, although you’ll have to pay tax when you do. But there are some things you can’t do with an IRA. There are strict rules against certain “prohibited transactions,” which are spelled out in the tax laws. And there could be adverse consequences if you don’t comply with the requirements. 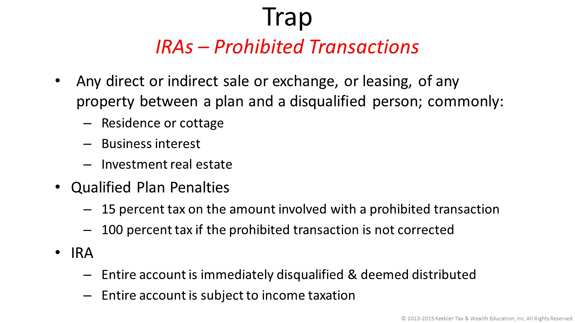 The IRS defines a prohibited transaction as any improper use of an IRA by the owner, his or her beneficiary, or any “disqualified” person. That last includes IRA fiduciaries and members of the owner’s family. An IRA fiduciary is someone who (1) exercises any discretionary authority or control in managing the IRA or exercises authority or control in managing or disposing of its assets; (2) provides investment advice to the IRA for a fee, or has any authority or responsibility for doing so; or (3) has discretionary authority or responsibility for administering the IRA. You can, however, effectively take a short-term loan from your IRA by withdrawing funds from it and then depositing the same amount back into the same or a different IRA within 60 days. That is technically a “rollover” and is not treated as a prohibited transaction. If a prohibited transaction occurs, your account stops being an IRA as of the first day of the year of the violation. The net effect is that you’re treated as having received a distribution of all of the IRA assets equal to their fair market value (FMV) on January 1 of that year. Assuming the total FMV exceeds your basis in the assets, you owe tax on the difference, just like you would on any other withdrawal. Plus, you’re generally required to pay a 10% penalty if you’re younger than 59½. Other rules restrict the types of investments you can make in an IRA. For instance, you can’t invest in life insurance or collectibles such as works of art, stamps, precious stones, or jewelry. With a few limited exceptions, IRA funds also can’t be invested in gold or silver coins. And the IRA can’t hold any property that you personally use, such as your primary residence or a vacation home. Holding certain other types of real estate, however, such as undeveloped land, may be permitted. The tax law gives you plenty of leeway with regard to IRAs, but there are limits to that freedom. Make sure not to step over the line.